Wow how time flies. 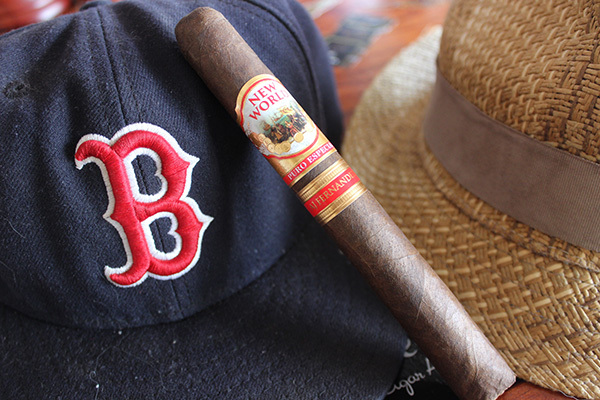 To think it was over 3 years ago when I sat down on my rocker and wrote about getting some satisfaction with the New World by AJ Fernandez. That was a fine cigar and made it into the Stogie Press Top 25 at number 10 in 2014. 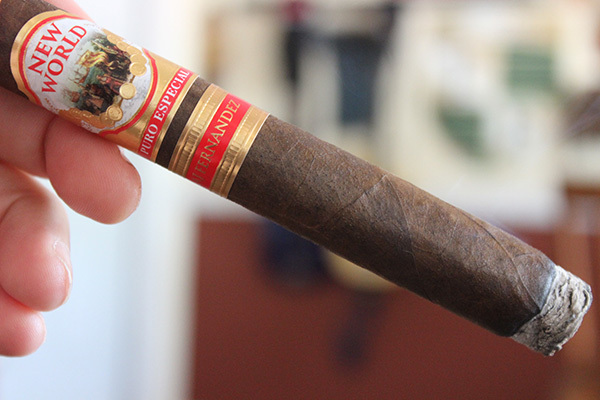 Now here we are 3 years later and I am sitting in the Stogie Press lounge looking for more satisfaction but this time with the new AJ Fernandez New World Puro Especial which was released at this years IPCPR. I have to say AJ’s booth was pretty busy and I did not get a chance to stop in to say “hola” at the show, but I have been keeping an eye on what AJ Fernandez has been doing in the industry. It seems everywhere you turn, in the cigar world in 2017, there was something related to the man. So when I was over at one of my local Brick and Mortars – Jimmy’s Cigar Lounge – here in Melbourne. 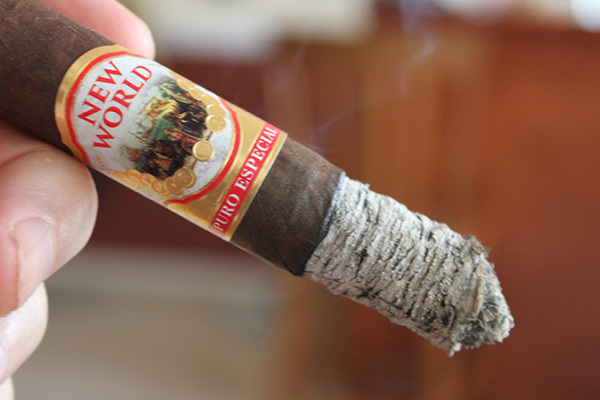 FL , it didn’t take a twist of the arm to pick up some of the new New World Puro Especial cigars. I sat with a few of my local friends and fired one up in the shop and it did not take more than 2 puffs to realize AJ had something special with this cigar. That was the Robusto, so today I fired up the New World Puro Especial toro as the first cigar of the day and a fresh palate just to make sure and it was spot on. Join me as I take you on another journey back to the New World. 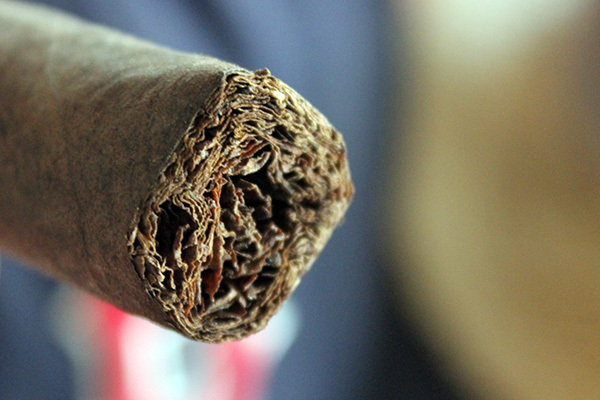 All the leaf used in this cigar has been aged 3 to 5 years. 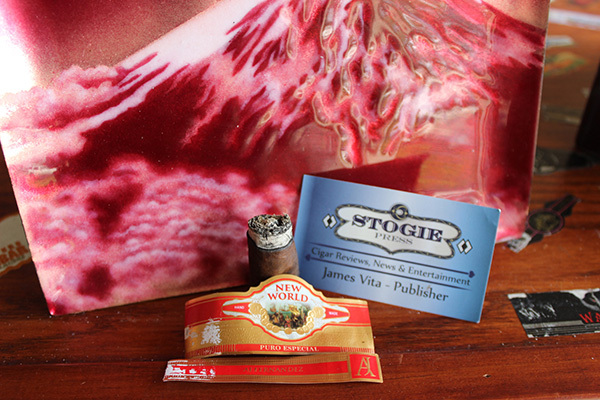 For this review I sampled both the Robusto and Toro vitolas which I purchased at Jimmy’s Cigar Lounge, Melbourne, FL I will say the notes are predominantly from smoking the toro and I just sat back and enjoyed the robusto. Before I set this ship to sail let’s do a proper inspection to be sure it is fit for the journey. 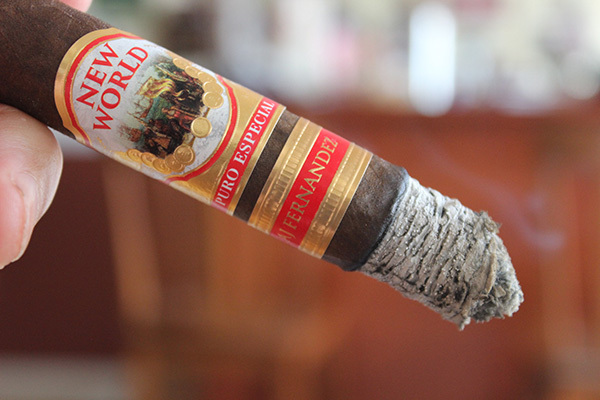 The AJ Fernandez New World Puro Especial is definitely a beautiful cigar to look at. Just starting with the bands on this cigar, that perfectly compliment the dark brown, toothy, and marbled wrapper. The wrapper has a certain glisten to it in the light. Running my fingers across the barrel I noted the slight waxy feel to the wrapper. It has a solid feel to it and resulting weight in the hand. 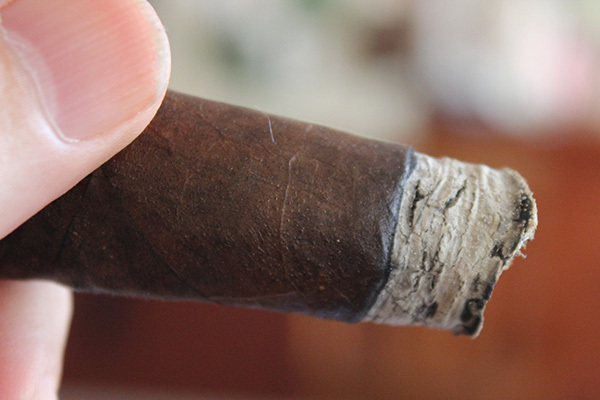 The cigar is finished with a well applied cap. There are two bands on the cigar, one under the other. Both bands use a red, gold, and white motif. 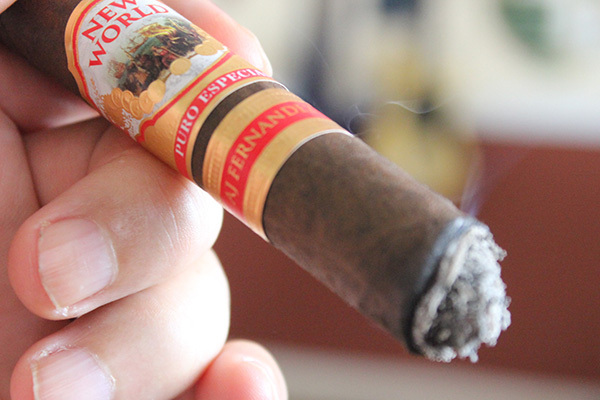 The primary band uses the same art as the original New World cigar and has a bright red bar on the bottom with the words “Puro Especial” printed in white. The secondary band identifies it as an AJ Fernandez product. As the sails are hoisted to take the journey, it is time to give it a good nasal test. of the foot I picked up notes of pepper, nut, and fruit. The barrel had just a hint of earth. Moving out of the harbor, I easily removed the cap and the cold draw provided a tight restriction and offered notes of raisin and pepper. This is one of those cigars you want to roll about and enjoy the pre-light flavor, and that is exactly what I did. Sitting back and letting the ship sail, a nice cool autumn breeze was blowing in to make the journey all that much better. I am really enjoying the early balance of the raisin and pepper. Of course I know what to expect having already enjoyed the robusto. With all inspections complete it was time to take the journey, once again, to the New World. 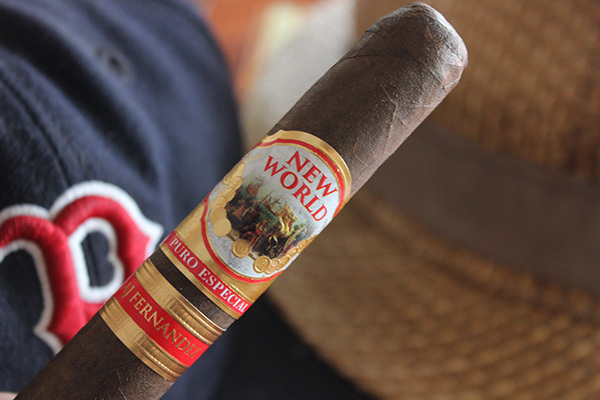 Overall, the AJ Fernandez New World Puro Especial was an outstanding cigar in my book, better than the original, and full of delicious flavor throughout. 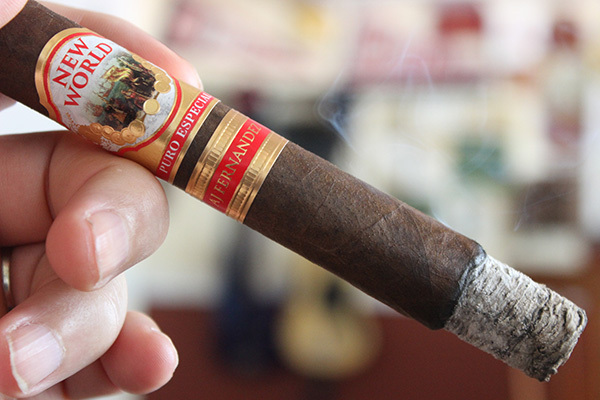 AJ makes it easy to enjoy his cigars with a price-point right in the consumers wheel house. This is one cigar I highly recommend and there is no doubt it will make the Stogie Press top 25 of 2017. If you can’t find these in your local shop, give Jimmy’s Cigar Lounge in Melbourne, FL a call and order some. This entry was posted in AJ Fernandez, Cigar Review and tagged AJ Fernandez, cigar review, IPCPR 2017, Jimmy’s Cigar Lounge, New World Puro Especial. Bookmark the permalink.